Lifelong Austin resident Toriano Lockett was incarcerated at the age of 19 on drug charges. Now the 41-year-old has become an active restorative justice worker, helping those who find it hard to heal from the harm caused by past conflicts and wrongdoings to reenter society – the same challenge he faced when he completed his sentence at age 21. “I was once part of the problem; now I want to be part of the solution,” said Lockett, a five-year member of Target Area, a South-Side-based organization that aims to prevent recidivism by generating conversations and re-building relationships between ex-offenders and the community. “You gotta know them and let them know who you are,” Lockett said Saturday during a restorative justice forum held at BUILD’s headquarter, 5100 W. Harrison St. 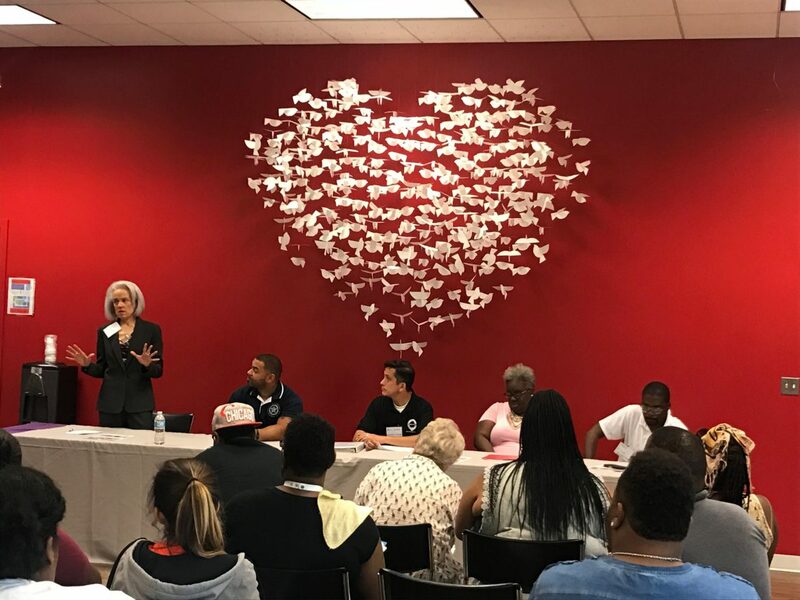 Dozens of residents, social workers and city officials listened to a panel discussion on the benefits of having ex-offenders, victims, families, police officers and others impacted by crime sit together, talk and hear about each other’s needs and feelings in an attempt to repair their community. To Lockett and many others who were involved in the criminal justice system or gangs, restorative justice practices, such as peace circles, are desperately needed. “It just allows us to see how humane people are,” said Akeem Soyan, 21, a member of Circles & Ciphers, a Rogers Park-based youth organization that addresses the aftermath of violence through music and spoken word performances. The organization was launched in 2011 on Chicago’s North Side, later branching out to the Austin community. “It gives us a chance to respect one another regardless of the background we come from,” said Soyan, who performed rap and hip hop with three other Circles members to welcome those who attended last weekend’s gathering. “Whether it’s being in a gang or not being in a gang, we all are still a part of that community, and we co-exist,” Soyan said in an interview after the performance. Soyan and his friend, Cassius Batts, 22, joined the group while students at Senn High School, which is “predominately GDs and specific gangs,” Soyan said. The hip-hop peace circle, which is created under the key principle of restorative justice – to restore relationships with the community – generates mutual understanding and facilitates reentry, Circles members say. “We not only recognized different perspectives but embraced other people and their perspectives as well,” Batts said. The circles are more effective in preventing future crimes compared to more punitive practices, said Sophia Hall, presiding judge of the Juvenile Justice and Child Protection Department of the Circuit Court of Cook County. “You have a community who knows about that youth and has offered up to support that youth,” Hall told participants during Saturday’s forum, adding the circle talks ideally include “whoever is affected in that youth’s life,” from schools, churches to local businesses. Participating in “non-judgmental and respectful” conversations is more productive. “After this crime thing is over, this is a youth now who has connections and the reasons for not wanting to disappoint those who placed some trust in them,” she said. 15th District officer Timothy Crawford agreed. While restorative justice stresses healing and restoration through conversations and circles, the offender is still held accountable, said Karen Lynn Morton, associate minister of New Garden Missionary Baptist Church and founder of the Austin Peace Center. While restorative justice practices are being increasingly adopted in schools and community organizations in Chicago as a way to reduce crime, there needs to be reforms in the court system to make it easier for young offenders to receive healing services, Judge Hall said. “We are still at the place where people who should not be referred to court are being referred to court,” she said. That idea was echoed by longtime Austin resident Yaa Simpson, who works for the ReCAST program under the Chicago Department of Public Health. “We need systematic changes,” she said. The resource division of the Juvenile Justice and Child Protection Department has created seven restorative justice hubs with community partners across the city since 2014, including the North Lawndale Christian Legal Center, Urban Life Skills in Little Village and Target Area in Auburn Gresham – where Lockett works. “Right now, it’s very important to have a restorative justice hub in the Austin community,” Lockett said in an interview, adding he’s been able to do home calls in Austin since the South Side-based organization opened its West Side office last October. In response to residents’ concerns, Morton said her organization is working with BUILD, Westside Health Authority and Austin Coming Together to launch Austin’s own restorative justice hub. She said another step to facilitate reentry is creating economic opportunities in Austin. Veronica Stein, manager of prevention services at BUILD, said in an interview it’s time for the community to pause and talk about how they can heal. “Often times, healing doesn’t happen in our communities – the black and brown communities and the underserved communities,” she said. While peace circle training can be expensive, last weekend’s event taught people something they can share at little cost, Stein added. Cook County Commissioner will host the meeting 6 p.m. Aug. 27 at BUILD, 5100 W. Harrison St. Please RSVP by email or phone. Help come up with viable solutions for reducing violence and healing from trauma Sept. 23 from 11 a.m. to 4 p.m. at BUILD's headquarters, 5100 W. Harrison St. The free event for people of all ages will feature raffle prizes. West Side teens are invited to participate in a "speakeasy for justice," which will be held 10 a.m. to 1 p.m. on April 6, 13 and 27, with a performance set for 7 p.m. May 3. What about the other Laquans?